Hola !!! love tu outfit!!! esta muy frio por ai? besos linda!!! Wow! You’re absolutely adorable! That coat is wonderful, what an amazing color! Love how you’ve put your cuff on your leather glove. great look, great colors, great picture !!! Love these warm cream and brown tones! Great clutch, and great scarf, too! I want to drink a cup of coffee with you! you are super stylish! beautiful style. you look amazing! Very elegant look ! I love the colors . i love the styling. it looks so luxurious! love the coat, the bracelet, and that amazing clutch! You look very chic. i love your benetton boots dear! Love the colours, and your glasses are perfect! love the camel coat, bag and scarf! omg love ur look!! picture perfect!! OMG What a stylish look! Every single detail is just perfect! Thank you for inspiring me! i am a new fan!! pretty as always..I love the coat & clutch on you! What else can I say other than you look fantastic! I have a similar pashmina from Vuitton and it does look great paired with a camel coat. you look so chic!!! love your boots! perfect look dear!love your bag! you look exquisite..the outfit is amazing! I tagged you in an Icebreaker, the rules are on my blog participate if you’re interested! Amazing outfit sweetie, I love the scarf!!! This is a beautiful look and that clutch is quite amazing! You look so classy, elegant and beautiful. Super chic outfit! I esp love those boots and that bag! You look so elegant like always. Kisses. love your outfit the clutch really pops and love the scarf! so chic dear so chic ! ! you look so chic! 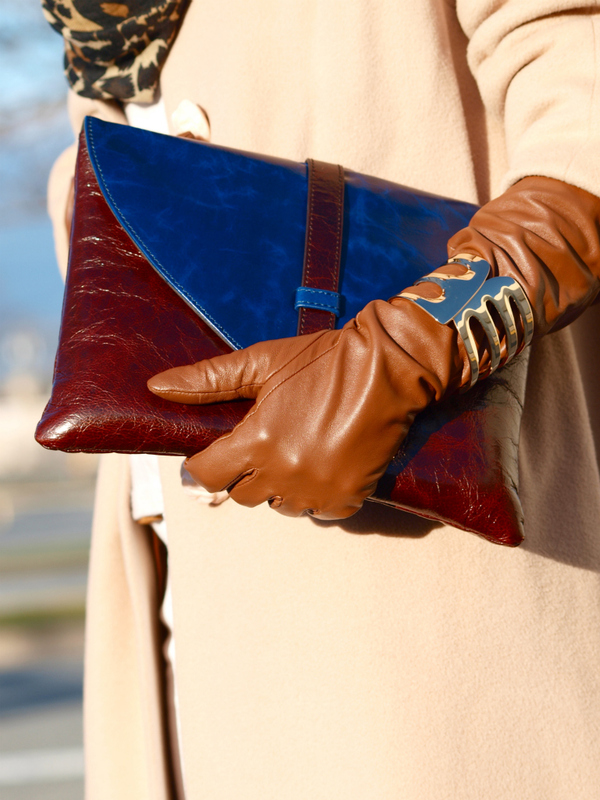 i love the coat, clutch and gloves!! thank you for these wonderful comments!!!! Amazing! Amazing photos! I love the leopard and color blocking. Great outfit, love the jacket and the clutch! Love the colors! The coat is fabulous, has a beautiful shape! Love your outfit, especially the coat’s color. Your look fab. Gorgeous photos! In love with the color palette! woowwwwww ı love this outfit !!! I love the buttons on that coat its dreamy..
Hello darling! The whole outfit is so gorgeous! I am in love with that bag and the bracelet. Your bag is AWESOME! Love this outfit. The leopard and that camel are so exquisite together! Personally I find camel such an elegant shade and you put together an amazing look with great attention for the colour combination of the details. Veronica, I loved how you style the Agatha Ruiz de la Prada piece: you made a very original mix of patterns! You look so incredibly chic in this outfit. Great outfit, love the tan and camel shades, not to mention the burst of blue. very nice pictures love the coat though the entire outfit is amazing! love your scarf and clutch, very elegant outfit! Great blog! You look gorgeous. i love your outfit! really classy and timeless :) and i want to have your beautiful coat. gorgeous look!your photos are so nice!!! I love this outfit, it’s totally my personal style. Ohhhh i love your outfit!! Love how you put the cuff over the gloves! you look very sophisticated! I absolutely adore your scarf! I can’t believe you got it from H&M!!! You look super chic! Beautiful, exquisite look! The colors fit perfectly! Loving your milk-chocolate brown gloves! so elegant! so great and the combination WOW . Great colours, I like this coat, gloves, choes, scarve….Very nice!